The International Gem Show Directory is the most complete, comprehensive, updated and accurate "printed database" — a bi-annual almanac — of gem, mineral, rock, fossil, jewelry, and bead shows in the world. 20,000 directories — 10,000 distributed January through June, and another 10,000 June through December — are distributed at the largest and most important gem and mineral shows in the world, shows that attract the world's best sellers and buyers of gemstones, minerals, and fossils. Distribution of the Directory begins each January with 1,000 distributed at the Quartzsite Rock & Mineral Showcase and into February with 7,000 distributed all the top shows in Tucson. 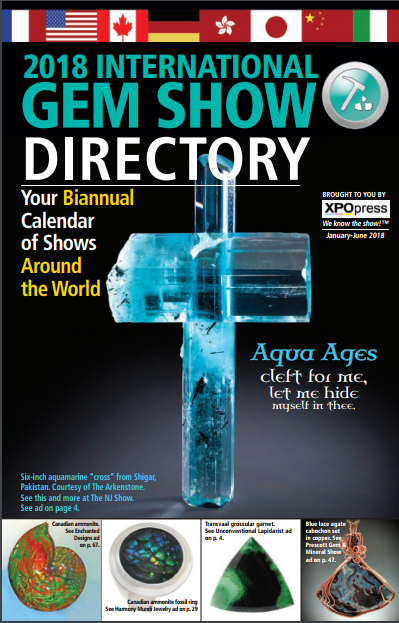 Distribution of the Gem Show Directory continues for the following 10 months at the most important gem and mineral shows in the world.